I am a huge believer in the "holistic" experience. Especially when creating art. I think the environment should support the approach and the message that is being communicated in whatever art is being made. My studio has always been a place for inspiration, fun and "sharing" all qualities that I try to capture in my food photography and in the experience that clients and crew have working with me here. The time had come however to change things up a little at the studio. Everyone loved the studio as it was, but it needed to change a little. Update. I am always looking on Pinterest, at blogs and reading magazines, so really wanted some of the new looks and color palettes to be a part of my workspace. I loved the grey tones that I was seeing, the zinc furniture that was starting to emerge and the BLACK STAIRCASES that create so much drama! So I pulled the trigger and did a re do. The studio has a lot of the same pieces of furniture they just got rearranged and reconsidered- some pieces were painted grey or black which has made them feel totally new. The space works a little differently now, and it feels different. I found that this "novelty" is good - makes my brain work differently too. One thing that was fun, was that my cutting board collection got to be shown off a bit more. I have gotten a great response to this. I was thrilled when Victoria from SF Girl By The Bay decided to feature the studio on her hugely popular blog. Here is the blog posting! WHO WANTS TO LEARN IN TULUM, MEXICO WITH US? i’m so happy to introduce you to today’s unexpected guest, award-winning san francisco-based photographer leigh beisch. leigh has transformed a victorian home in san francisco’s sunset district into one of the loveliest and most inviting photography studios i’ve yet to see. the studio was recently given a facelift — the floors redone with grey, and the space got new paint colors throughout, including a dramatic and stunning black staircase. leigh enlisted help from her friend and interior designer, leann wanninger, who was incredibly helpful in pulling off the re-do during a very small time frame, when the studio was closed for the holidays and between photo shoots! leann is responsible for a lot of the decorative ideas around the studio — leigh is a collector of props and vintage finds — and leann worked with many of leigh’s collections to create an uncluttered space that reflected leigh’s vision, and passions. leann said, “working with leigh and in this truly unique and creative space made me feel like a kid in a candy store! leighhas a discerning eye not only behind the camera but beyond — which i knew the instant i first eyed her collections of glassware, stacks of vintage linens, ceramics and the fabulous flea-market finds she had gathered over time. it’s a hardworking studio space and like any place that’s lived in over time, it just needed a little TLC in the reorganizing and restyle department. above all, i set out to help create a vibe where the creative teams and clients would feel instantly welcome, inspired and comfortable. we worked to organize and arrange furniture to suit the studio’s workflow. we de-cluttered and edited to minimize the furniture footprint which helped to create that open, airy feel. there were ample hidden treasures to be found throughout so the creative display ideas came about naturally!”. together, they’ve created an enviable studio space that i could have moved right into. leigh’s clever eye for detail is no doubt in much part to her studies in painting, and photography at the school of the art institute of chicago and rhode island school of design. moving from new york city to san francisco with her husband, an animator, leigh opened the studio, quickly attracting major clients like williams-sonoma and creating stunning photographs for product packaging, and food — including several gorgeous cookbooks. leigh says, “my work as a painter influences my photography,” says leigh. “color, shape, texture and the boundaries of the frame are subjects in and of themselves and i try to capture an emotional response to the subject and the setting, much as abstract paintings do.” her personal work, a series of abstract landscapes, has been exhibited widely throughout the bay area, and is in fact how i first came to know leigh — when i purchased one of her fine art prints as a birthday gift for myself! i can’t wait to get on with this studio tour and share leigh’s inspiring space with you. for more from leigh, be sure to visit her website, and instagram feed. my husband dana and i moved to san francisco from new york city for a better live work balance. when we first got here — we stumbled across sutro heights park and we were blown way by the overlook of such a majestic coastline. palm trees and sparkling waters below. we thought — wow, this is living in the city?!! most of the places we have lived in san francisco have been out toward the ocean, with proximity to golden gate park. being close to the open spaces makes us breathe easier. we love the vibrancy of the city, but also like the feeling of open space — space to think and breathe. san francisco offered that to us and it is one of the reasons why we call it home. it offers such a multitude of experiences — diverse ethnic restaurants and shops, people from all over the world living and visiting bringing their different outlooks on life. again — the feeling of openness and being able to breathe. i think that for my husband and i as artists — that is crucial. walking for sure. coming from new york, we were a bit concerned that we wouldn’t be walking and exploring as much. it is one reason we didn’t end up in L.A. inner sunset is a very walkable neighborhood, in fact if you don’t walk and keep your eyes and ears open you might miss a quirky little shop or restaurant, or that green apple books has joined le video in their old retail spot to create a fabulous addition to the neighborhood! i also love listening as i walk around. you hear so many different languages spoken here. my studio manager’s daughter just graduated from middle school in the neighborhood and there were 20 different languages listed on the ceremony booklet for the languages spoken by the student body! i enjoyed finding out that my neighborhood originally was all sand dunes where slowly smaller houses were built for the folks who worked downtown. a trolley car was built to take them downtown for work. the neighborhood was very sparse and rural back then. pretty cool. coming from the east coast, i see san francisco as somewhat of a wild west town that exploded into a city. it has kept its free thinking and entrepreneurial attitude. people here feel like they can follow a dream, like have an idea then create a company in their basement and turn it into a multi million dollar business! it has happened. in fact craigslist got it’s start right around the corner on 9th avenue! our last trip was to london — i hadn’t been there since i lived there as a child. it was very interesting to see where some early childhood memories were formed. so i guess i brought back some insight into myself. i also brought back a beautiful peter doigne print and a mug from the new tate. i like to collect mugs from my travels. i have a mini obsession with kitsch. using the mugs daily reminds me of the different trips and memories. even the folks at the studio (clients and crew) enjoy seeing the different mugs. some are tacky (in a fun way) and some are beautiful. the tate one is elegant. our favorite dive chinese restaurant is literally right around the corner — san tung. it has a huge following though, so there usually is a line. go early for lunch or do take-out. we love the dry fried chicken and the green beans! we have nicknamed the chicken — ‘chicken crack’ since it is so addictive. we haven’t been in a while, but i love the palm court for high tea. it’s hard to get in during the holidays, though! reminds me of the grandeur of old san francisco. my 9 feet long (was originally 11 feet long) french farm table from interior perdu (now called grenouille) — i have bought a lot of things from coco and fred (a french brother sister team). now you can find them not only at their showroom but at the alameda flea market. we have used that table for so many things, for sharing meals, for doing projects, as a prop in photo shoots! everyone loves this table! i love diversity, so am always wanting to hear new music. i also like hearing what others are listening to — especially those who come to the studio — so spotify is the thing i am into right now. i like being introduced to new sounds etc. (new to me). that being said, my current playlist has a lot of indie stuff that has a bit of a fun beat. hot chip’s “over and over”, generationals “say for certain” — that sort of thing. things you want to tap your foot to as corny as that sounds. uggg — playing the guitar. one of the food stylists i work with is amazing at it and will play at the studio after wrapping the shoot. playing music is like painting or doing art of any kind — you can loose yourself in it — it is incredibly therapeutic — also, live music is so great to have around. i have tried to learn but find that i don’t have a gift for it nor the amount of free time to learn it. someday. well — my family of course, my pug. 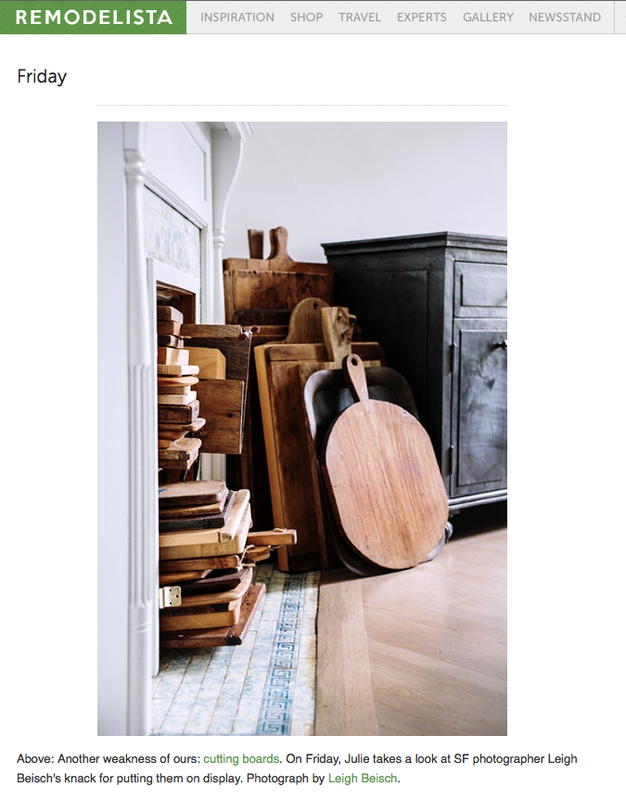 but to be more material — i cherish my cutting board collection. i use them so much for my work. i love to look at them and all their incarnations. they have been collected over the years. some are gifts too. i shouldn’t say this, being a photographer — but manuals bore me to tears. i learn through experience — trial and error, asking people. manuals are so cut and dry — so absolute which seems so not art — so i guess i object to them. learning something needs to be more fluid, more multi-directional. some people are great at learning from them — my husband can absorb a manual in a matter of minutes — then go build a motorcycle engine from the ground up. he is artistic too — so i guess to each their own. i don’t like to just follow directions — i use them as a guide and jump from there. • photography by cindy loughridge for sfgirlbybay. Please note that the photo credit above should read Cindy Loughridge- the person who took all the photos for the SF Girl by the Bay article.